The Hong Kong Rugby Union men’s and women’s sevens squad have shown well on their first international sevens appearance since January at the Borneo Sevens. 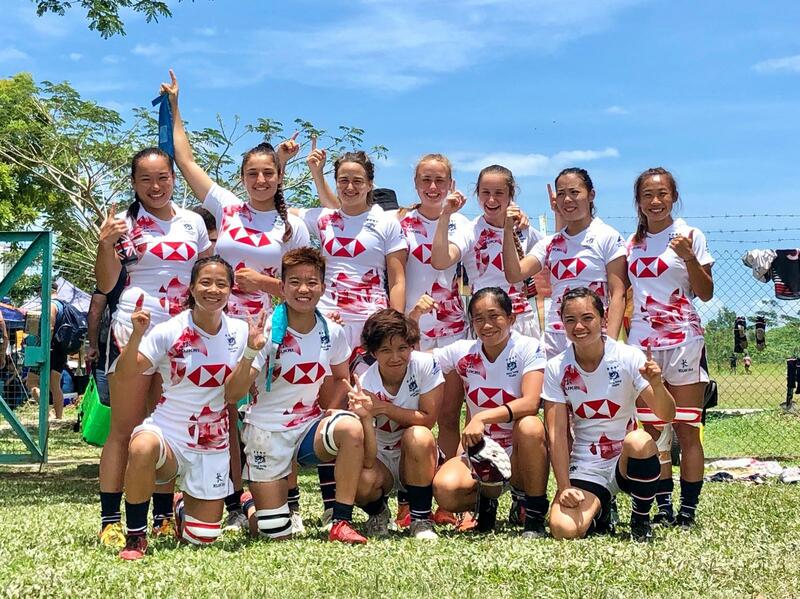 Defending cup champions in Sabah, the women’s squad - in their first full campaign under new coach Iain Monaghan, (he arrived only days before the trip to Fiji at the start of the year), posted 91 points without allowing any in opening matches against the Philippines’ Lady Volcanoes, 34-0, and a Singapore High Performance Development squad, 57-0. Their road to the cup hit a pothole in the Japan Pearls a team combining emerging Japan sevens talent with three players with New Zealand Black Fern pedigrees, two of whom were influential in the Pearls’ 36-7 win. An early intercept try chance for Chong Ka-yan instead resulted in a yellow card for an intentional knock-on against the speedy winger, triggering a tough first half for Hong Kong as they fell further afoul of the referee’s interpretation in the first half. Hong Kong were penalised six times in early stages, four of which led to eventual tries – and all of which were were scored by the New Zealand internationals on both wings. Hong Kong trailed 24-0 at half-time and fell further back to start the second, as the Pearls scored again on the wing to push the total to 31-0 before Hong Kong’s first reply. That reply came from Chong who finally got her try when she turned the corner on the defence, and chipped and recovered to complete a 50-0 metre effort. Colleen Tjosvold added the conversion as Hong Kong put its first points on the board, but the Pearls scored late to push the final total to 36-7. Hong Kong’s results see them safely through to the cup quarterfinals with the game against Pearls potentially a preview of tomorrow night’s cup final. Hong Kong will play local side Panthera Ladies who finished third in Pool B, tomorrow at 9.30am and could advance to a semi-final rematch with the Pearls. With the objective preparing for the HSBC World Rugby Women’s’ Sevens Series Qualifiers weeks away in Hong Kong, the level of competition, if not the loss, was welcomed by Monaghan. “The day has been excellent. We took two out of three and the girls are gutted about that last game. They don’t feel like they represented themselves the way they can in the first half and their effort in the second was much better. If we can have three more games like that tomorrow it will be a great way to build up for Hong Kong,” he added. Coach Paul John’s men’s seven had a similar test in their second outing today, escaping past Australian side Coloundra, 19-12, after a convincing opening win, 42-7, over RIMAU, the Malaysia National Services seven. RIMAU beat Coloundra heavily in their pool clash, but the Australian side looked a different unit against Hong Kong, obviously gelling after getting a competitive game under their belts earlier. Hong Kong struck first through Jack Neville, who continues to ease his way back into action after a significant bicep injury late last year, with Russell Webb striking the conversion for a 7-0 lead. Coloundra struck back surprisingly easily, levelling the score at 7-all as Hong Kong found itself in an unexpected arm wrestle. The Aussies nearly scored again from the re-start, but forward Michael Coverdale forced a key turnover in defence of his try-line. Seb Brien and Raef Morrison linked well moments later to push Hong Kong’s lead to 12-7, with Webb’s second conversion sending Hong Kong into the break up 14-7. Defensive experts Alex McQueen and Cado Lee Ka-to came on to start the second half and were pressed into heavy duty as Coloundra drove to Hong Kong’s try-line. The next few minutes saw an impressive goal line stand from Hong Kong with Coloundra awarded several scrums and then a questionable yellow card against Jamie Hood, who caught an attacker at knee level less than a metre from his try-line but was penalised for a high tackle. Outnumbering Hong Kong the Australians eventually found the space out wide to ship a second try and pull within two after the missed conversion, trailing 14-12. A determined Hood re-entered the field of play from the sin bin to take the re-start 50 metres through the middle of the defence before setting the attack loose out wide, with captain Max Woodward eventually finishing in the corner to put Hong Kong home for good, 19-12. The men will play Wipers Tsunami, second in pool B behind Iconz Australia in the last cup quarter final tomorrow at 11.20am.